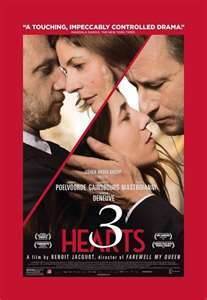 There are many things wrong with the French film “3 Coeurs”--”3 Hearts”--but it will be memorable to me for two reasons: the first being a horrendous completely wrong ending and a soundtrack that kept me looking for “Jaws” to pop up on the screen! The story is about a man who falls in love with a woman only to, unbeknowingly, marry her sister. 70 years ago many versions of this was made in Hollywood starring Bette Davis and Mary Astor and/or Olivia DeHaviland as the sisters and either Herbert Marshall or George Brent as the man. A decade or two later it would have starred Susan Hayward! Now we have Charlotte Gainsbough and Chiara Mastroianni--the real life daughter of Catherine Deneuve and Marcello Mastroianni--as the sisters who fall in love, inexplicably, with the bland Benoit Poelvoorde, with neither of the women having chemistry with him. The director, Benoit Jacquot, who co-wrote the screenplay with Julien Boivent, has many times talked about his admiration for the films of the 40s and 50s and he seems to piece many of them together here with the melodrama but not the believability. The opening scenes seem to find us in “A Man And A Woman” or “Brief Encounter” territory and along the way there is “Back Street” and “An Affair To Remember” but, getting back to that ending, he does something that hasn’t been done to shock an audience since a certain TV series pulled a fast one in the 1970s. I don’t believe in giving any spoilers so I’ll leave it at that. It is always great seeing Deneuve in a movie but remembering how she would have easily played one of the female leads in her heyday it is sort of disappointing seeing her playing the mother of the two women in a one note role. The camera deservedly spend a lot of time on the faces of Gainsbough and Mastroianni but too much time with the inappropriate , annoying, music. There is no rhyme or reason for the ending of this movie. All I can suggest is that its running time is 1 hour and 48 minutes and you should leave the theatre and/or stop watching it at 1 hour and 40 minutes and make your own ending.